We are your quiet, comfortable, and reasonable lodging heaven, just off the hustle and bustle of Highway 395. The clean and comfortable rooms are bright and well lit and easily accessed from your own personal parking space, adjacent to your door. 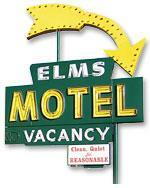 The Elms Motel is located next to the Bishop City Park and you have gated access to the park with it's pond and tennis courts.